It's taken me a long time to find this bike so just want to get all things ironed out so it will last and I can enjoy it for a good long time. Coming from an owner who freely admitted he knew nothing about maintenance and never even changed the oil in all the years he had it, I want to get things back on track. Just the way I am, I guess. Appreciate all the help and advice. I hope to ride this weekend. Where I live in Connecticut, trials is non-existent. Only one club in the state and very private, hard to get into. There is a group in Rhode Island (next state over) and they have hosted national and even international events with the top riders. Where I live now it's very rural. Lots of forest but unless you own it... off limits. Connecticut is mostly open space dotted with small communities yet our state has refused to set aside land for off road vehicle use. Even though a law was passed way back in 1986 ordering the Dept. of Environmental Protection to do so, nothing was ever done. Unlike, say, the State of Pennsylvania where they have thirteen state parts set aside for such use. It's a money maker for the state between vehicle registration, sales taxes, fees to use these parks, hotels, restaurants, etc. Some years back, I purchased property a few towns away so I'd have a place to ride my dirt bike. That was a smart move on my part. The property is basically the way it was since the ice age. Boulders, small cliffs, streams, rocky wet upward paths, land going up and down. Really perfect now that I have a trials bike to ride on it. This is embedded into the tail section on my bike. 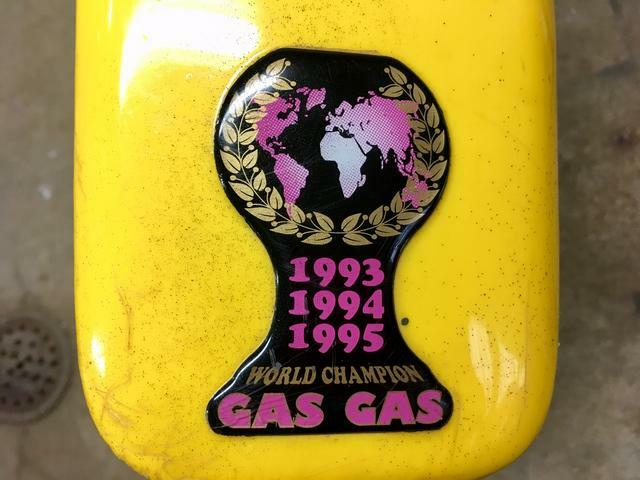 Apparently, Gas Gas has seen some hard times. The shuttered factory in Spain was only recently reopened under new ownership. Let's hope it can find its way back. Last edited by Chesterspal; 10-19-2018 at 07:19 AM. The petcock is marked with a C when to the right and with an R when to the left. I assume C is closed and R is reserve. I only got gas to flow when set to R.
Is straight down suppose to be the normal flow position? 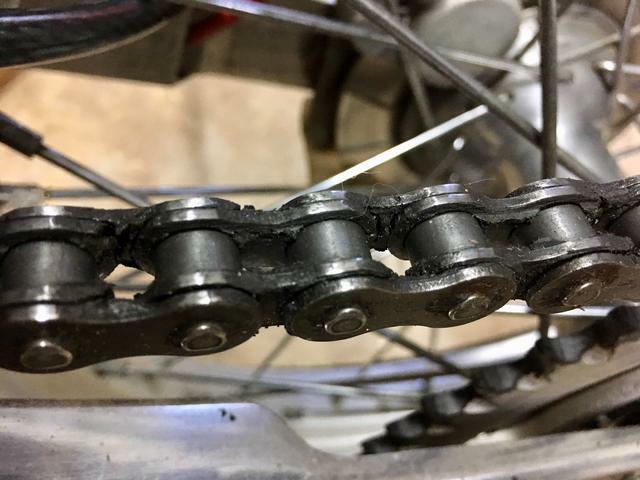 The chain on this bike is covered with thick gear grease, as you can see. Is there a reason you'd want to use grease as opposed to standard motorcycle chain lube as I do for my dirt bikes? Cleaned my chain down to the bare metal in my degreaser tank, reinstalled and coated with Honda chain lube. Had issues with the clutch not fully releasing. Doing a bleed made no difference although there was air in the line. 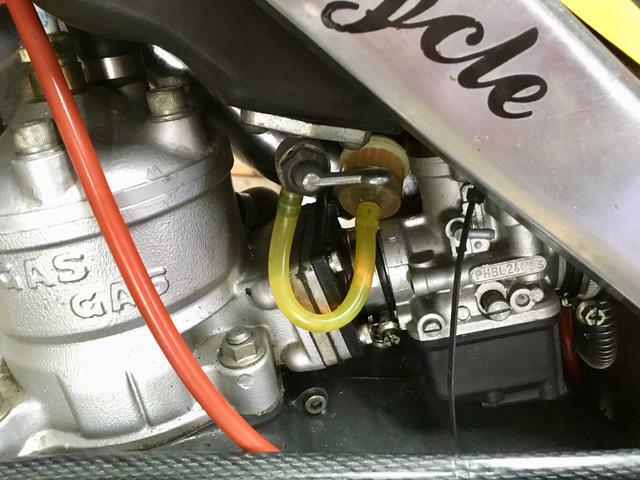 Turns out the pressure spring in the clutch slave was missing and it was worn inside the cylinder to the point it was leaking hydraulic fluid into the bike and mixing with the transmission oil. Ordered a complete new cylinder to replace it. Jim Snell is a great resource for these older parts and for his knowledge of the machine. My 200 TXT was sweet on the clutch. Was warned that some gear oils caused issues so only used what the dealer had. It was an odd one. Escapes me. In the dirt bike it find Motul Expert means Kickstart in gear ok. But it can be ridges in the basket. Had to file them out on my EC200.